Heavy rain, a burst pipe, or local flooding can cause more than just water damage to your home. 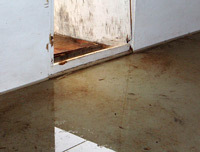 Standing water and dampness can lead to mildew and mold growth, which can present an even greater health hazard. Mold and mildew needs nothing more than moisture and a food source, such as wood or wet drywall, to grow and spread. Mold spores can begin to grow in a just a few days. Once it starts growing, it is common for fungus to spread to nearby areas, such as surrounding walls, behind paneling or wallpaper, on the top side of ceiling tiles, or beneath carpeting and padding. When mold spores are present in sufficient quantities, they can present a health hazard to occupants. So-called “black mold” (Stachybotrys chartarum or Stachybotrys atra) can cause a wide variety of health problems over the short and long term. Common symptoms from mold exposure include allergic reactions, asthma flare-ups, bronchitis, headaches, sinus congestion and even immune system disorders. Infants, young children, the elderly, and people with existing health problems are more susceptible to illness related to mold exposure. The best thing a homeowner can do after a flood or water incident is to have the place professionally dried by a company that specializes in water removal. Flood water can be pumped out quickly. Then, combined with high-speed fans and other technology, the affected area can be safely and efficiently dried and disinfected. If necessary, a dehumidifier can be set up to keep the relative humidity at a reasonable level. If the water and moisture is removed early early enough, you can save yourself the hassle of an expensive mold removal job down the road. In the case of an emergency or a local disaster, it’s important for homeowners to have a reliable company that they can count on. H&H Environmental water cleanup crews will respond within 30 minutes. We service New York, New Jersey, Connecticut, Massachusetts, Westchester and New York City.